Get the Fiddlehead Fern recipe featured in Family Ingredients on PBS. Thoroughly wash fern shoots, taking care to remove as much of the small “hairs” on the stems as possible. Fill a large bowl with water and ice. Set aside. Bring a large pot of water to a rolling boil. Add a hefty pinch of salt and the fern shoots. Cook for 30 seconds to one minute, until the shoots are a bright, vibrant green. Strain and drop into cold ice water to stop the cooking process. In a medium size pan over medium high heat, melt butter and add bacon. Render down the fat of the bacon without browning the bacon too much, 3-4 minutes. 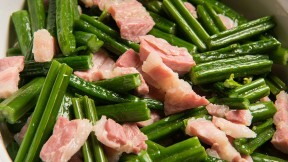 Add the fern shoots and stir, coating each piece with bacon fat and butter, about 2 minutes. Serve hot.